Festivals are essential threads woven in the fabric of Indian society. These are special occasions for social get-together with family, friends and neighbors to forge new bonds and strengthen the existing ones. And they come ever so often. There are probably more festivals and occasions for celebrations than there are days in a year. This jun Hajarat Ali's Birthday.Hadrat Ali (R.A.) was born some thirty years after the birth of the Holy Prophet (Sallallahu ‘alaiha wa Salam). He belonged the most respectable family of Quraish, the Banu Hashim (i.e. Hashmites). His father Abu Talib was the real uncle of the Holy Prophet (Sallallahu 'alaihi we Salaam) who brought him up after the death of the Holy Prophet's grandfather. Ali’s mother was Fatimah bint Asad, who belonged to Banu Hashim. Hadrat Ali’s patronymic name was "Abul Hasan". 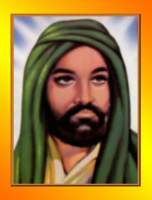 The Holy Prophet gave him another name, "Abu Turab" which was most liked by Hadrat Ali. The Holy Prophet (Sallallahu 'alaihi wa Salaam) took Ali in his childhood from his father, Abu Talib, and brought up him like his own son.